The trial was initiated on August 12, 2010 on the 15th fairway of Trysting Tree Golf Course located one mile east of Corvallis, Oregon. The course is over 20 years old and has a history of dollar spot on the 15th fairway which borders the Willamette River. The symptoms typically occur in late summer and early fall when temperatures cool and humidity rises. The turf species growing on the trial site was a mix of colonial bentgrass and annual bluegrass. Subsequent applications were made every two weeks on August 25, September 8, September 22, and October 7. The individual plots measured 50 square feet (5 ft X 10 ft) with a one foot border between each plot. The products were applied with a CO2-powered sprayer using TeeJet 80015 nozzles at 30 psi producing a total spray volume of one gallon per 1,000 sq. ft. The plots were mowed Monday, Wednesday, and Friday at 0.5 inches using a fairway mower. Irrigation was applied using a Toro irrigation system to minimize drought stress. The plots were not fertilized during the trial but the turf was healthy. Visual percent dollar spot and plot quality ratings were taken on September 24, October 7, October 20, and November 11. Data from each rating date were subjected to analysis of variance using a randomized complete block design with 4 replications. Differences between means were determined by Fisher’s LSD at the 5% level. Additionally, a contrast was performed for the November 11 data comparing the plots treated with high vs. low rates of the different chlorothalanil formulations. *Treatment 14: The five applications were applied in the following order: Curalan, Trinity, Honor, Curalan, and Trinity. 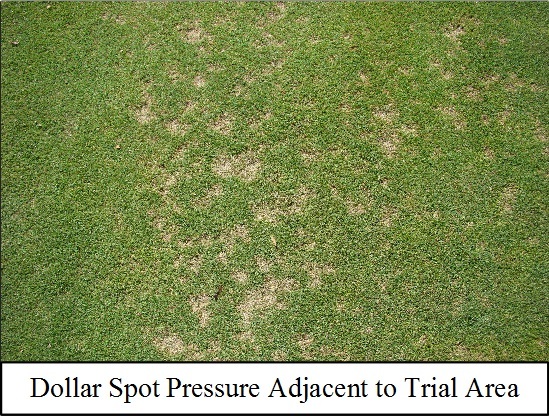 The disease pressure in this trial was fairly low with untreated check plots averaging 7.5 percent at the end of the trial (Table 2). All fungicide treatments provided nearly 100 percent control. All the plots treated with fungicides had excellent turf quality (Table 1). On November 11 - the last rating date - there was a significant statistical difference (p-value=.047) in plot quality between the chlorothalanil products treated at the high rate vs. the low rate. The average plot quality ratings for all the chlorothalanil products treated at the high rate vs. the low rates was 7.7 and 7.3, respectively. Whether this difference is meaningful as a practical matter is debatable. *ns = not statistically different.